We had another great Crochet workshop with Penny O'Neill on Saturday. I even made a bit of time to join in, as my crochet skills have become a little rusty over the years! I love the versatility of these circular motifs! Any size, any colours, any combination of stitches, any yarns!! A great way to use up your stash. 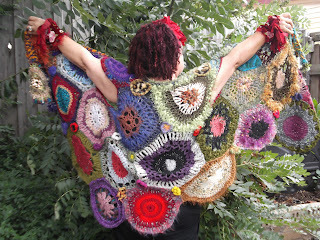 Congratulations to Shirley who had never really had the chance to master crochet skills but now she is flying! Thanks Penny for your generous sharing of knowledge and stories. We all loved your coat of many colours. HAVE YOU HEARD?? Precious Purl now has a Facebook page! Check in often to see specials that we will feature and become a liker to keep up to date. Our next workshop is Felted Spring Flowers on Saturday 13th October. Email for all the details.